Luke Doerner is today’s guest joining us on the Join Up Dots podcast is a man i originally connected to as a listener of Join Up Dots and now is making his bow as a guest. Originally from Victoria Australia, he we won a bronze medal for Australia in men’s hockey in 2008, where he scored a goal in the 6-2 win over the Netherlands in the bronze medal final. 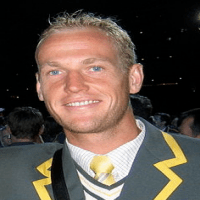 His other successes with the Kookaburras include a gold medal at the 2006 Commonwealth Games and the 2005 Champions Trophy title. Now what makes this guy interesting to me is a couple of things for sure, not least is his desire to win and put himself into the firing line of competition. Firstly, unlike many players who enter the sport he was a late bloomer for sure, not making his international debut until the age of 25. Which asks the question, why so late? Was it just that he hadn’t found his natural swing in the sport, or was it something else that prevented the spotlight shining in his direction until later than most others. And secondly, with a natural talent in a very specific aspect of the game “the Online Drag Flick”, how did he take this and create a nice income for him and his family? So is his strategy simply to hustle it out and bulldoze his way forward, or something else? And what has lead him now to come out of retirement and enter the game once more in the Masters category? Luke shares how he niche downed on a specific element of his sport to sell to the masses, but actually found that only the elite wanted his product. We chat about the period when Luke hadn’t quite committed to one particular sport, and then saw a dramatic change in his fortunes when he did. Luke confesses that missing out on Olympic Gold still bothers him, which shows the true competitive edge that he has to prove himself. Why sending a simple email, could sometimes be the thing that hold you back from a life of your dreams.